Learn about the Dachshund’s history, diet, and health to discover what makes this breed unique! Short-legged hunting dogs are thought to have been found across Europe since the Middle Ages, but this breed originated in Germany where its name Teckel means “badger dog” – giving a clue to its original work. Today’s Dachshunds often still display a tendency to disappear down holes after badgers or rabbits. In the UK, when it comes to Dachshund types, we recognise two sizes of Dachshund: the Standard and the Miniature. We also recognise three coat types: Smooth Haired, Long Haired and Wire Haired. Due to its long, slinky body, the Dachshund is also known as The Sausage Dog! The Dachshund has a compact and muscular body with a level back and short limbs, which still allow free movement and keep the body clear of the ground. It also has a long, slightly conical head with almond shaped eyes and high set ears. Wire Haired Dachshunds are typically covered in a short, straight and coarse coat – with the exception of the ears, which should remain smooth. They should have bushy eyebrows and a beard on the chin. 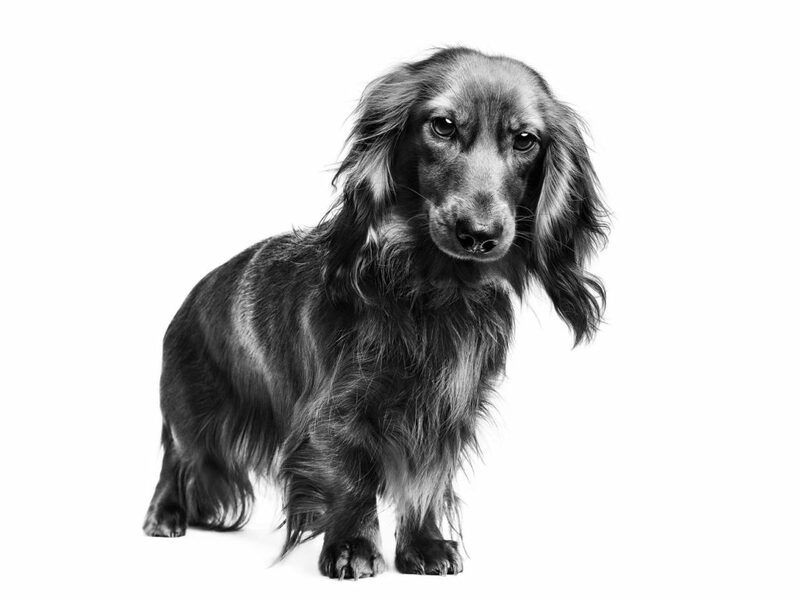 Smooth Haired Dachshunds have a short sleek coat, except on the underside of the tail where it should be coarse. Long Haired Dachshunds are coated in soft and straight hair, which is longest on the underneath of the body and neck – with abundant feathering on the legs and tail. Determined, lively and bold, the Dachshund’s intelligence and sense of independence are well-known in the dog community. They are sociable and loyal to their owner, but their instincts can sometimes take over in the initial stages of training! When giving your Dachshund exercise, the sight of your Dachshund running is truly one to behold for its sheer pace alone! Bone and joint development is key for the Dachshund puppy for the entirety of their 10 month growth period. Maintaining an ideal weight during growth and supporting muscle tone is also important. An adapted diet is beneficial as Dachshunds typically don’t have the same high energy needs as other mini breeds during their growth. Support for the developing natural defences and digestive system is also beneficial, which is why antioxidants, quality proteins and prebiotics are ideal inclusions in a Dachshund puppy’s diet. 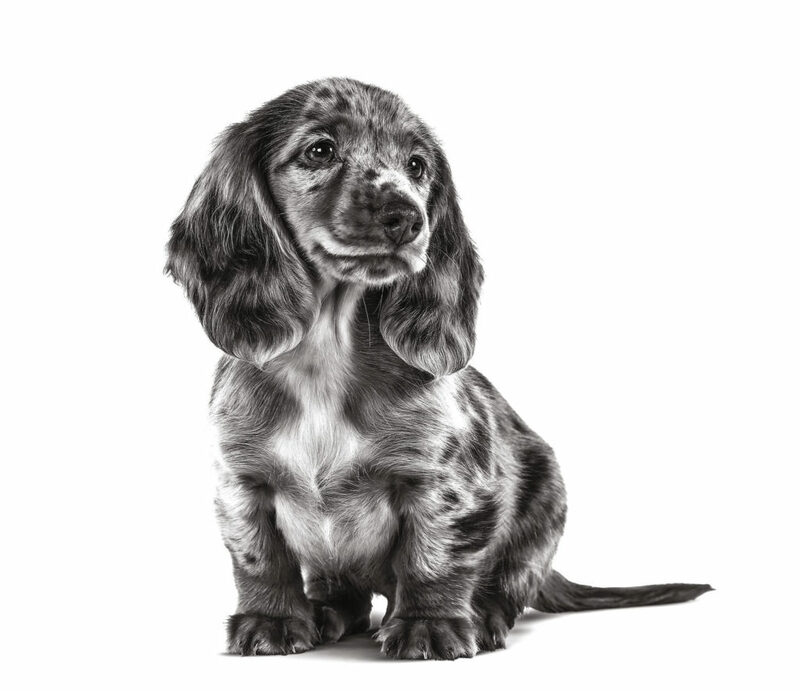 Ideal Dachshund Puppy food: ROYAL CANIN® Dachshund Puppy. The specific body shape of the Dachshund means that an adapted diet can be beneficial in providing nutritional support to help maintain muscle tone. This is the case as long as the diet also helps to limit excess weight gain with a balanced supply of quality proteins and fats. Bone and joint support is also highly important, which can be accomplished through the provision of the ideal balance of calcium, phosphorous and EPA/DHA. Like many small breeds, the Dachshund can benefit from a diet which contains very high quality proteins and selected fibres, including prebiotics to support digestive health whilst reducing faecal smell and volume. Ideal adult Dachshund dog food: ROYAL CANIN® Dachshund Adult.